The TALL Group recently invited payments specialists from both Northern Ireland, and south of the border in the Republic of Ireland, to a dedicated seminar at the iconic Europa Hotel in Belfast. Delegates heard the very latest news and views from speakers such as the Cheque & Credit Clearing Company (C&CCCo), and from DIA Europe (Kappa), the technology team responsible for suspect fraud alerts within the clearing infrastructure. Attendees were also provided with a valuable perspective from the US and Canada by Digital Check Corp., and the TALL Group’s own thoughts on the state of the Image Clearing initiative soon to be launched here in the UK in October 2017. Actually, the depth of experience amongst the participants, delegates, presenters and service providers pretty much answered all these questions. The event left all concerned with a view of a challenging but achievable project, which will make the good old dependable cheque a really efficient payment mechanism for those who still want to use it – and there’s still an appetite for cheques, with 500 million being issued each year in the UK. There’s also the view that the industry will be able to side step, and learn from, the mistakes made during the implementation of a similar system in the US and Canada. It is clear to see that when serious and professional people from Building Societies and Banks come together and commit to making something work, common sense prevails, and it will all be fine in the end. The industry is about to see unique British-based fraud prevention innovations, (our UK truncation system and cheque specifications are somewhat different to anywhere else in the world) ,and a genuine collaboration to communicate the new clearing cycle (basically funds available next working day). 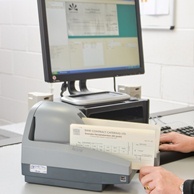 The technology is not rocket science, but delivers a robust and cross-sector solution, which will help to ensure that the image-based clearing system (ICS) will be a great success and make the cheque – on which so many in the population depend – a more efficient and modern payment mechanism for as long as anyone wants to continue to use cheques.